Look super-stylish with this American Indigo Double Sided Twill Jacket - Olive (TWJ2) and make a bold statement this season. 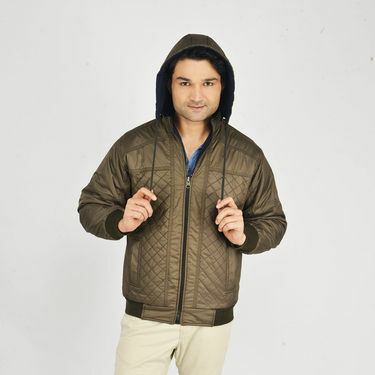 Trendy and comfy, this jacket is padded for extra warmth especially for wintry days. Finely crafted with an impeccable finishing and sporty design, you can wear dark olive side in the morning and blue melange side for the evening to glam up your style quotient. Available in four size options, American Indigo Double Sided Twill Jacket - Olive (TWJ2) ensures an amazing fit to keep you extremely comfortable all day long. Jackets never go out of style. 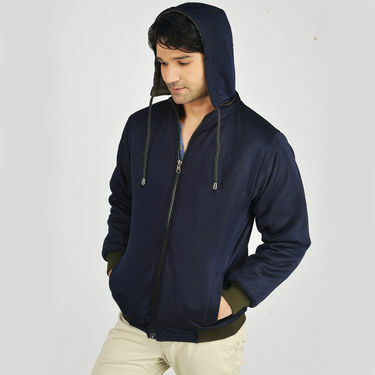 Be it a summer evenings or wintery day, they have its own classic and elegant way of attracting everyone from the crowd. 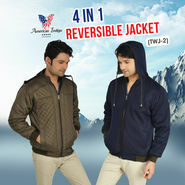 Wearing jacket enhance your overall personality and if you are passionate about biking, it becomes essential part of your daily life. So, if you are looking for a jacket that not only have sport design but is very useful in functionality, then we recommend you to pick American Indigo Double Sided Twill Jacket - Olive (TWJ2). 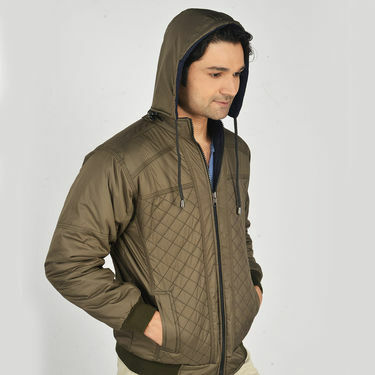 We have tried and tested this jacket and review it that will help you in picking the same. Breathability: This is where American Indigo Reversible Jacket holds our attention. The polyester fabric in the jacket translates to easier air vapor flow from inside to outside. The reversible Jacket has soft liner that helps wick moisture off the skin, keeping the interior feeling dry. Function: The ribbed cuffs on the Reversible Jacket are adjustable. We liked that we could flip this jacket and end up with a different, more casual look. And there are slant functional pockets on each side. The zipper on the jacket keeps it look clean and minimalistic. We recommend this jacket as an ideal to carry when enjoying outdoor occasions like driving a bike, chilling at wintry areas and so on. Durability: After several weeks of use we didn?t notice any signs of wear & tear on the American Indigo Double Sided Twill Jacket - Olive (TWJ2). 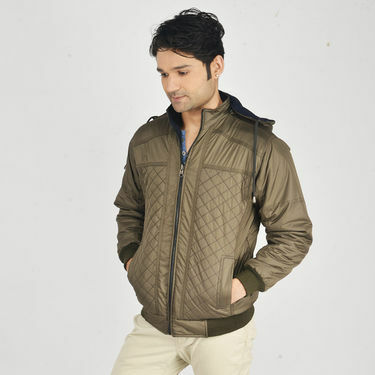 The jacket is extremely durable, wrinkle resistant and comfortable for daily wear. Also, it resists stretching and sagging. Colour: Dark Olive for casual meetings and other Blue Milange for dazzling evenings. Can be switched as day and night wear. Saves your money on buying different jackets. 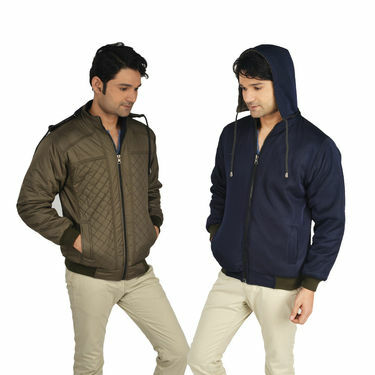 You own two types of jacket at the cost of one. Packability: The American Indigo Double Sided Twill Jacket - Olive (TWJ2) is light is average for a summer weight shell, but considering it?s two jackets in one, it could be argued it?s extremely lightweight. And without any second thought, we recommend this jacket for wintry days. Reviewer: American Indigo Double Sided Twill Jacket - Olive (TWJ2) is minimal, detailed, confident, yet supremely practical and versatile, without being elitist. We highly recommend this jacket, as it is truly worth buying at this price without compromising on its quality. 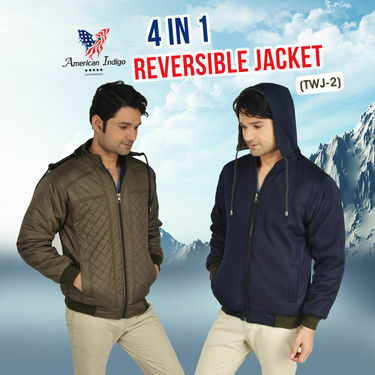 4 in 1 Reversible Jacket (TWJ2)VSBuy 1 Get 1 American Indigo Fleec.. 4 in 1 Reversible Jacket (TWJ2) VS Buy 1 Get 1 American Indigo Fleec..
4 in 1 Reversible Jacket (TWJ2)VSAmerican Indigo Reversible Jacket.. 4 in 1 Reversible Jacket (TWJ2) VS American Indigo Reversible Jacket..
4 in 1 Reversible Jacket (TWJ2)VSPick Any One Leatherite Jacket fo.. 4 in 1 Reversible Jacket (TWJ2) VS Pick Any One Leatherite Jacket fo..
4 in 1 Reversible Jacket (TWJ2)VSAmerican Indigo Double Sided Prem.. 4 in 1 Reversible Jacket (TWJ2) VS American Indigo Double Sided Prem..
4 in 1 Reversible Jacket (TWJ2)VSAmerican Indigo Set of 2 Fleece J.. 4 in 1 Reversible Jacket (TWJ2) VS American Indigo Set of 2 Fleece J..